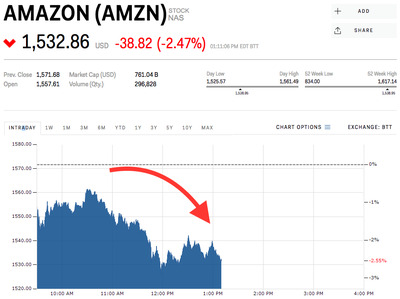 Shares of Amazon dipped 2.42% on Monday, part of a broader tech selloff led by Facebook. News broke on Saturday that Facebook had granted controversial political research firm Cambridge Analytica access to more than 50 million Facebook profiles who thereby illegitimately used the data to sway voters in US and UK elections. There are concerns that Facebook’s data privacy breach, and any potential response from regulators, could impact other tech companies. Watch Amazon’s stock move in real time here.